The year has started badly – one of our Black Rhino bulls was killed on the first full moon of January. A year ago exactly I predicted in my Dec 12 / Jan 13 newsletter that the rhino poaching deaths for 2013 would reach a figure around 987. This was based on a simple mathematical calculation. I was not far wrong – in fact the figure was 1004. What a terrible disgrace ! What is equally disgraceful to me personally is that there are some very well-known conservationists who actually believe that the solution to rhino poaching is to have legal trade in rhino horn. These guys so lack basic logical thinking that it is truly unbelievable. I am going to spell it out really slowly for these mamparas : Put simply, the demand for rhino horn will ALWAYS exceed supply so the idea of “flooding” the market with rhino horn not only will result in the immediate buying of such “legal” rhino horn but will encourage further demand and consequently greater poaching and an even faster extinction of the species ! We had a similar situation with elephant tusks some years ago and, guess what, it helped exactly ZERO ! In fact the poor elephants are once again under siege as the ivory market is resuscitated. What I would like each and every reader of this newsletter to do is this: Contact your local newspapers/magazines/radio stations etc and tell them how you feel about the imminent ultimate demise of the rhino. Make sure all your friends and family are aware of its terrible plight and hopefully with enough publicity, someone, somewhere will make a difference! Blue and white and yellow veld flowers make bright colour splashes against the green background of the bush and the evenings resound with the metallic clink of fruit bats. Insects fill the air. Woodland kingfishers make the air trill with their calls and they flash electric blue wings. The edges of the waterholes are dotted with the white foam nests of the tree frogs. This is the beauty of the African summer. On the sunset drive on the 11th of December, we spotted three lionesses. We also heard elephants breaking trees. An elephant arrived and all the lionesses moved away. The next morning, we found eight cubs and eight lionesses trying to hunt giraffes but the cubs were walking on the road and giraffes saw them and bolted. On the 15th of December during the bushwalk, we heard elephants breaking trees. We found two big bulls and one calf sleeping on the ground. While all the happy clients were enjoying watching elephants, another elephant came from the back, so we found ourselves in between elephants. He was not aggressive though, we just moved away so he could go through to join the other elephants. The guests took beautiful pictures. This month the bush treated me with a few leopard sightings and some amazing lion sightings. Shortly after leaving the lodge another guide told us that he had seen a leopard down the road. When we got to the area not a single trace of her could be found and everyone was feeling rather down – all our efforts had been in vain or so we thought. On our way back to Tremisana Lodge it seemed as if it was a long drive as everyone’s spirits were low after not finding her, but as we came around the corner, there in the distance we saw something walking along the road. Neither I nor my tracker could see what it was, as we got closer it darted into the bushes giving us just a quick show of spots and instantly we knew this was the leopard. We slowly made our way forward then to our surprise we saw her head peering from behind the bushes as if checking that it was ok to cross the road and then she appeared on the road completely carefree to our presence. We watched and followed this amazing creature for about 500m before she eventually disappeared into the bushes !! Twenty minutes into the Sunset Drive we arrived at a lion sighting I had been tipped off about. Everyone on the vehicle was ecstatic about being no more than 5m away at some point if not closer allowing for some really great shots. There were five females and eight cubs. We spent an hour with these beautiful animals. On the 5th of December the day started with the promise of heavy rain. At Orpen it was clear and we were greeted by a white rhino walking along the fence of Kruger. Two kilometres further two cheetahs were stalking some impala. The wildebeest saw the cheetahs and alarmed the impala. At the Orpen gate we came across a bachelor herd of buffalos. Near Talamati we saw a pride of lions. 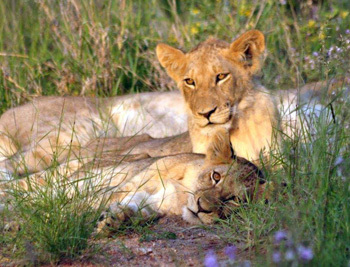 The pride had 10 cubs and three lionesses. At Rabelais stream there was a big herd of 500 buffalo. It was a good welcome for the guests who arrived at Tremisana on the 15th of December. At the water hole in front of the Lapa at Tremisana Lodge there was a giraffe drinking water. We came across three buffalos lying near Tremisana dam. Along the Olifants River a Black Rhino charged us. He stopped only five metres away from the car. I switched off the engine and the rhino turned back and disappeared into the bush. On the 17th of December we drove on our newest traversing concession – the Barnard property. We saw three lionesses stalking an elephant that was busy feeding. One of the lionesses got very close to the elephant and the elephant picked up the scent and the lioness went and hid in the bushes. On the 22nd of December I conducted a champagne breakfast safari. Close to the air strip around 6am we saw a pride of lions with newborn cubs. On the 1st of December during the sunset drive we saw a Serval cat on Nonwane. The Serval ran across the road into the bushes – it was difficult to take pictures. Later we saw an African Wild Cat. The cat was very relaxed and paid no attention to our presence. We spent ten minute on the sighting. On the 2nd of December I went to the Kruger National Park for a full day safari. We started successfully with a sighting of two White Rhinos on Timbavati Road. We also saw a large herd of elephants near Nsemani Dam. At Bobejaankrans we saw a big male baboon sitting very close to the road eating a baby Impala. The guests got a chance to take some very unusual pictures. On the 9th of December we saw fourteen lions on Nwanetsi River road (S 100) eating a baboon and about a hundred metres from the scene there were fifteen male buffalos. Seven kilometres further we saw a big hyena with two cubs at their den. On the 10th of December during the morning bushwalk we were charged by a black rhino just above the natural spring on Rome 1. I tried to dodge it and Wesley took the guests to a safe area. When we were safely hidden from the black rhino we heard elephants trumpeting behind us. Five minutes later we were approached by a large herd of elephants. We managed to escape by taking a safe direction. Luckily no one got hurt – but everybody sure was excited and will never forget this experience, myself and Wesley included ! On the 25th of December, Christmas Day, we had a special Christmas present : on Oxford we saw a big male leopard busy eating a baby warthog about two metres away from the road. We saw a herd of elephants near Timbavati River Bed. We came across a male lion at Sonop waterhole. We also had two different sightings of rhino bulls near Satara. At Girivani watering hole we came across a breeding herd of 800 buffalos. We spotted a rhino with a new born calf running across the road near Mudzadzeni. At Shibotwana wind mill we came across two elephant bulls fighting. We were very close to the sighting that for a few moments the guests were a bit scared at the sight of such great beasts fighting. When we left the sighting everyone couldn’t stop talking about it. We had two different lion sightings on the S100. We had a good visual at both sightings. On Timbavati road we managed to spot a lone elephant bull. He seemed very agitated and mock charged our vehicle. The guests became scared and excited at the same time. 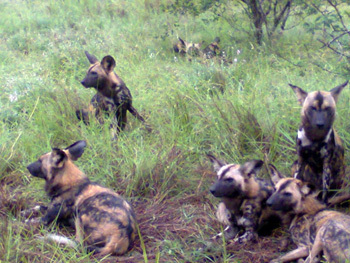 We had a brilliant sighting of a pack of twenty five Wild Dogs lying close to the road. On the 6th of December it was very hot – the temperatures were ranging around 32C. It was difficult to find animals but I managed to find four out of the big five . On the main road from the main gate to the reception there were six buffalo bulls lying in the mud. We saw a White Rhino crossing the road. About 3km before the end of Rabelais we saw a pair of mating lions. We saw elephants crossing the road before Nsemani dam -they were heading to the dam to drink some water. The 14th of December was another hot day again in the park. We managed to see elephants on Orpen road. We spotted a White rhino bull grazing on the side of the road. We saw many more elephants on the riverbed of Timbavati River. We found a herd of 400 buffalos at Shimangwanani dam. We saw a male lion on the S126 Sweni road. On the 18th of December while driving in Kruger we saw a large herd of elephants crossing at Rabelais and buffalos on the S36 road before the t junction of S126 Sweni road. We spotted two white rhinos drinking water. We saw two male lions two hundred metres after the S125 road towards the baobab tree lying under the shade. On our way back we saw two hyenas crossing the road. While looking at the hyenas we saw seven wild dogs running along Rabelais road to hunt down some impalas.The impalas saw them before they arrived and they ran. On the 22nd of December we saw all of the Big Five. We had three sets of lion sightings. The first one was on the S36 – two lionesses with cubs, three males on the S126 and nine lions lying close to the road on the H1-3 main road. We spotted some rhinos on the S127 and elephants at Timbavati River. Ten kilometres along Timbavati S40 we saw a leopard next to the road lying down. We saw some buffalos on Rabelais. This time of the year is the Amarula season. 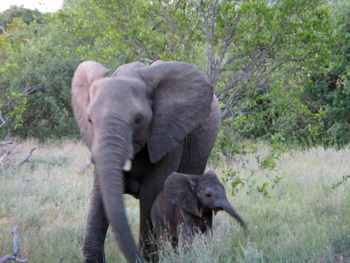 At Tremisana lodge there are many animals that come to look for marula fruit: they come to right outside the lodge. The elephants get very close into parking area eating fruit right in front of the gate and at night we hear them walking around and feeding. It makes the guests feels happy and have a real African experience. During the day they visit us as well to drink water accompanied by buffalos. On Olifants road there were giraffes crossing the road whilst everybody was looking at impalas. Behind the giraffes were two lionesses trying to attack. As we got closer, the lions started running towards the giraffe and giraffe moved away immediately. The lion kept on running after them for a long distance. On the way back from the new Marula Tree Boma (where we have brilliant Bush Braais) we found the lions again at the airstrip busy eating an impala. There were ten of them, two lionesses and eight cubs. There was not much left only a few pieces of bones and skin. The cubs were fighting because there was not enough meat for all of them. We went through the Orpen gate and exited using Phalaborwa gate. We found all the Big Five and lots of general game. The first animals we spotted were two male lions walking along Orpen road. One of them was roaring and walking very slowly, until it got close enough to us. A few metres away from them there were four lionesses looking at impalas, zebra and blue wildebeest. We spent almost one hour watching them but nothing happened. At Nsemani dam we saw fourteen lions, two males and twelve lionesses drinking water and waiting for the giraffe to come down to drink. But the baboons were there and started to make a noise to warn the giraffes. After a few minutes the lions walked away and hid in the bush. We drove to Timbavati picnic spot on S 40 and along the way we spotted a leopard on a branch of a tree. Near Olifants along S 39 along the way there were lots of elephants and buffaloes. We also managed to see a black rhino on the S92. On the 22nd of January the temperature was about 40 C. At Phelwana Bridge along the Timbavati River we saw two male lions that had just killed a waterbuck. One of the lions walked down the river to drink whilst one stayed behind keeping guard on their kill. After quenching his thirst the lion went back to the carcass. The vultures decided to try their luck and descended upon the carcass only to be given chase by the two lions. 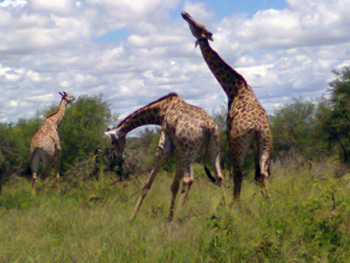 Just before we got to Satara we saw two male giraffes fighting. They were approximately thirty metres away from where we were. They fought until they made their way close to the road next to our vehicle. I had to reverse the vehicle to give them space. We watched for a few more minutes until they took their brawl back into the bush. After lunch at Satara we drove towards Olifants. 12 kilometres on, we were fortunate to see lions just after they had killed a buffalo 15 metres from the road. A jackal came by and tried his best to get close to get a share of the meal. When he saw one of the lions lying close to the carcass the jackal quickly ran away. The 5th of January was my first day in Kruger National Park in the New Year. We saw a white rhino lying down in the water. There were also lions on the S126 Sweni road before Welvierdiend Windmill. There were lots of elephants on our way back to Orpen. Before the Rabelais Junction about seven kilos to the gate four Wild Dogs were running crossing the road to the north. On the 9th of January I managed to get four out of the big five. We saw elephants on Rabelais; buffalos at Timbavati River before S36 turn off to Mudzadzeni. We saw three lions about 11,5km at S125. On the H1-3 Satara main road we saw some hyenas outside their den. We also saw a lot of birds on this day such as the secretary bird, saddle billed stork, korhaan etc. On the S127 we saw four white rhinos in open area. We saw buffalos along Timbavati road and more general game including zebras, giraffes, kudu’s, waterbuck, bushbuck, steenbok, wildebeest etc. On the 17th of January in Kruger National Park we came across a herd of elephants crossing the road about 5 metres before the T junction of the Orpen main road. We came across two white rhinos along the Timbavati River. We also saw buffalos on the S100 and elephants on the way back on the Sweni road. The highlight for us was when a leopard crossed the road right in front of our vehicle and lay right in front of us in the bushes. On the 18th of January I first did the bushwalk at Tremisana. We saw a wild cat, a few elephants as well as hippos. During the afternoon I did a drive at Tshukudu. We saw rhinos, buffalos at double dam. On the northern side of the dam an elephant nearly hit my vehicle. The elephant was about three meters away from us. The guests were very scared to have an elephant so close. On the 24th of January I did the afternoon drive in Balule. We saw a herd of elephants on Rome 1 and giraffes, zebras, kudus and warthogs on Barnard. We were very fortunate to view three black rhinos drinking water. It was beautiful and the guests were very happy. The start to 2014 could not have been a better one with many exciting animal sightings. 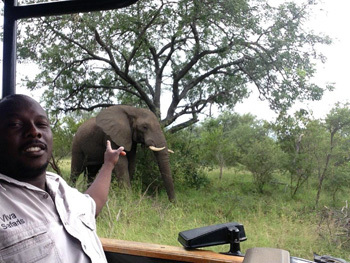 This year I am also conducting safaris at Tshukudu. It is a private reserve not far from Tremisana. 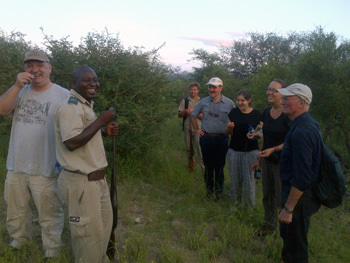 My guests and I headed off to the reserve with eager hearts hoping we would have a good drive. Not even 100m out the lodge seven buffalo bulls greeted us in the waterhole as they had their afternoon spa treatment in the mud. We heard a call in on the radio that they had located lions and elephants. Shortly after getting to the area we found tracks for the elephants and immediately got excited as we knew they could not be far so we headed towards the nearby dam. We saw the tail of what I knew was an elephant and instantly went rushing towards that area to find 4 elephants standing there busy feeding around a marula tree picking up all the fruit and having a good time. Shortly thereafter we had a great sighting of a White Rhino and her calf. Now with the three in our pocket all of us were on the edges of our seats hoping to see that lion they had called in on the radio. We found a beautiful male with his female and to our amazement as we got there the male gave us a huge roar that shook the car itself before he collapsed again and fell asleep. We spotted a lioness sleeping underneath an acacia tree guarding a wildebeest carcass. Vultures arrived on the scene and started helping themselves to the carcass. The lioness tried her best to chase them away by attempting to pounce on them numerous times. The number of vultures quickly increased and overwhelmed the lioness until she ran away. The vultures descended on the carcass and fed on the carcass until they had finished. While driving in the park we came across a leopard dragging a baby impala across the Timbavati River Road for about twenty metres. The leopard then dropped the carcass and looked at us for about five minutes and then she disappeared into the bush. We also encountered a breeding herd of elephants in Nsemani watering hole swimming and drinking water. Then we encountered four buffalo bulls chasing a cow on heat. After a few minutes of chasing with no luck two male buffalos started fighting each other. The bulls went against each other banging heads and the sound that emanated was like two cars colliding. We saw four lionesses hunting a warthog and they managed to catch it. They were approximately fifty metres away from the road. 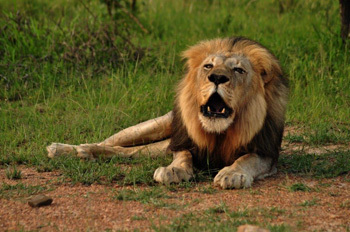 My clients were absolutely thrilled – not every day do we get a sighting of a lion kill! The lionesses tore into the carcass with such ferociousness and intent that they finished their meal quickly. We saw a pack of twenty five wild dogs lying in an Orpen road about thirty metres from the road. One female woke up and licked every member of the pack. We spotted two cheetahs stalking some impala on Sweni open area. The impalas quickly detected the cheetahs and ran away. We saw a ground hornbill kill a leopard tortoise and eat him. First time for me and I have been guiding for 20 years! On the Timbavati dry riverbed we spotted two lionesses lying underneath the wild date palm along Orpen road. As the day progressed we came across a black mamba. It is a venomous snake and this one was an astounding 4,5metres long. The snake was in the middle of the road and stood up a half metre for about five seconds and then slithered away into the bush. On the 7th of January about 6km from the Orpen gate we saw a pack of wild dogs. They were about ten of them in numbers. They were lying on the side of the road. We viewed them for about thirty minutes. The puppies were busy playing around the vehicle. Guests loved it ! On Rabelais we saw a large breeding herd of 400 buffalos. Near Mudzadzeni picnic spot we saw a big male leopard with an impala carcass in the tree top. The visual was five out five and very close to the road. On Sweni road we saw thirteen lions. They were ten females and three male lions. On Nwanetsi road we saw a big herd of elephants. On the S90 we saw two white rhinos lying under the tree shade. On the 11th of January I went for another full day in the Park. We saw six lions on the S125. About 2km from Tshokwane road we saw a leopard. We viewed him for thirty minutes until we left him still relaxing in the trees. At the Tshokwane picnic spot we saw a huge breeding herd of buffalos drinking water and some were lying on the sand bank. On our way back on Nsemani dam we saw six elephants swimming in the water and two of them were busy mating. On the main road toward Orpen gate we saw a big rhino bull crossing the road. On the 14h of January we saw four cheetahs crossing the road towards Xibotswana Windmill. We also saw a rhino lying in the water. There were also some elephants near the Timbavati Picnic Spot. We came across a large herd of 300 buffalos on the S27. On the 26th of January I did a drive into the park with nine guests. It was raining heavily as we departed from the lodge. To our delight the rain stopped just after two hours of being in the park. On Sweni road about 3,5km from Mudzadzeni picnic spot we saw one big male lion lying five metres away from the road. Near Satara we saw six female lions lying about twenty metres away from the road. At Nsemani dam we saw a big herd of buffalos. On our way back to Rabelais about two hundred metres from Bobojaankrans, we came across a huge pack of wild dogs. They were about thirty two of them and they were lying on the road. On Talamati turn off we saw a big elephant herd crossing the road. The sun setting over the Drakensberg mountains was an ever present highlight of the evening drives. As the sun began to sink behind the mountains, the animals began to prepare for the night ahead. The diurnal animals such as the impala begin to head for open spaces, congregating for safety in numbers. The ever present black-backed jackal began its early evening search for potential prey, giving the Swainsons Spurfowl a reason to raise the alarm. The night sky illuminated by stars, Orion being the most prominent constellation, with Saturn just below. The sound of impala giving off alarm calls, as we head towards the lodge. As we get closer we notice all the impalas on full alert, looking in the same direction. From the darkness emerges the unmistakable shape of a spotted hyena, absorbed by the thought of impala for dinner. The zebra and kudu were a common sighting around the water hole in the mornings, scattering into the bush as soon as the vehicle got a little close. The black and white stripes of the zebra makes them easy to spot, whereas the well camouflaged kudu were more of a challenge. The golden orb web spiders caught the early morning light, illuminating their golden web. The large female looking quite relaxed in the centre of the web, while the much smaller male is often perched on the far side, keeping a safe distance from the female. While driving along one of my favourite roads, we picked up the sounds of monkeys making a lot of nose in a nearby tree, this is often a good indication of predators in the area. It proved to be just that, as we slowly turned the corner the noise became even louder and there walking through the bush was a pride of lions. All in a row with the lead female in front followed by six or seven 10 month old cubs. Our bushwalks are always filled with educational tidbits! We appreciate our home and wish our guests to do so too, down to the smallest of critters! Saying this we have been fortunate this month to have some amazing elephant encounters on foot. One where we had three bulls, we had the correct wind direction, tree cover and a nice small group of guests (meaning we were extra silent! ), these factors allowed us to get 10m away from the elephant, safely and leaving him undisturbed. Another was an unexpected encounter with a bull in musth (a testosterone filled male elephant! ), needless to say surprising an elephant in musth produces a surprise on both your part and his! In the past month we have been lucky to have some drives which have included sightings of the Big Five! Whilst these drives were special, nothing can beat the drive of the month, which occurred on the early evening of the 10th. Barely starting our sunset drive we came across two black rhinos browsing calmly, the guests busily snapped away on their cameras, capturing photos of what I believe was their first and could sadly be their last black rhino sighting. On the evening of the 25th we had another memorable drive, which started with spotting a mature bull elephant with only one tusk, munching away on Marula fruits. Shortly after we got a call over the radio of a lioness with seven cubs and made our way to try view her. As the sun was setting, ours was the last game viewer still looking for her, instead of driving up and down we decided to turn off the vehicle and listen for the noisy cubs. This paid off and we found them around the corner in some thickets. This was especially memorable being the only viewer and with the setting sun as a back drop to such a great sighting. In the extreme thickets of summer bush it’s been a tough month to try find the elusive leopard but been getting extremely lucky having three different sights of the smallest cat in Balule Nature Reserve, the African wild Cat. On two occasions finding the almost domestic looking cat nearby the newly set up Marula Tree Boma, proving to be situated in a perfect spot. We have almost always see elephant either heading up there for dinner or on our way back to the lodge. Other rarer sightings of genets, owls and Hyenas have become more frequent as returning from the boma at about 9pm, this being a great opportunity to see our nocturnal creatures. All and all January has been a great month for sightings not being fazed by our summer rains but rather using it to our advantage as the cats tend to become road walkers during these times. Looking forward to February and making memorable experiences with you guys!! We worked very hard to have the new Marula Tree Boma ready for its first Bush Braai scheduled on 1 January 2014. Thanks to Ronald who took responsibility for this project, it was ready by Christmas. Well done to all ! Tremisana has seen further building of staff accommodation. We are experiencing an increase in tourist numbers and consequently have employed more staff. We welcome 2 new rangers : Luke Ovendale and Christopher Schoeman. In addition, Vicky Wallace has volunteered for a month and adds a lovely feminine touch. Caroline Mnisi, who was employed by Viva when we ran Cheetah Inn, has rejoined us and tells me she is very happy to be reunited to her previous camp manager, Alice Ndebele. Marc’s Camp has had a lot of work done – Joseph our fulltime electrician is busy rewiring and the thatchers have been hard at work. 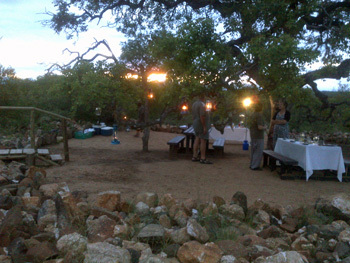 The BUSH BRAAI at Marula Boma has been a great hit. The guests have been absolutely thrilled and the constant chorus of wows, oohs and aahs make all that carrying of rocks worthwhile. As they get off the vehicle, they are given a cool facecloth to freshen up. The effect of the paraffin lanterns is great but what has been a revelation has been the effectiveness of the solar-powered jars. Placed on a plate covered with tin foil, they produce just the right amount of light to make for a very romantic and cosy dinner. In view of the length of this newsletter, I include only one each of the reviews written for each camp in December 2013 and January 2014. My husband and I stayed at Tremisana Lodge for 6 days and 5 nights, what a fab place. It’s lodges are comfortable but basic (everything you need). Even have a little pool with sunbeds. There is wifi in the dining area which is useful. We saw loads of animals, the guides we had Texan, Isaac & Jonathan were completely fantastic, so knowledgable and helpful. Felt like friends when we left. Rhi was fantastic at organising everything. We had two fantastic days at Kruger, rehabilitation centre, several game drives and a bush walk. All which we could do over and over again. The kitchen staff were also brilliant, food was fantastic, starter main and pudding each dinner and a good choice for breakfast. Thank you so much, we will be recommending you to everyone. From the time we arrived at Tremisana Lodge we felt safe and looked after. We were welcomed by Piero from Viva Safaris with vivacious charm and warm hospitality. The lodge and gardens are impeccably decorated, management is well trained and on top form. The en-suite we were accomodated in was luxurious,cool and impeccable and included extra treats. We had our own private terrace to view game and enjoy the view. All meals served were delicious,well presented and satisfying.Our experience at the newly built boma for a braaivleis dinner away from the lodge was superb!set in the middle of the bush with excellent lighting,staff,5 star ablution facility the experience was unforgettable! overall our stay was fantastic,the game drives are well planned and exciting and at a drop of a hat we would not hesitate to return for a much longer stay.we were sorry to say “ciao”! Highly recommended to every traveller…you will be delighted. Excellent value, service and location. The sheer beauty and rustic atmosphere of Marc’s Treehouse Lodge was so instumental in making my entire South African Journey one of the best of my life. If you want to get down with nature and all it has to offer, including impala grazing ourside your lodgings and monkeys playing on your front porch, this is the place to go for a great adventure. The food is so simple (and of course local) but so delicious. The daily agendas were well organized. 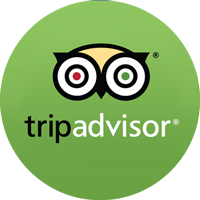 The staff was friendly and accommodating with no other motives than to make sure their guests were comfortable and happy. You were living in the bush for a few days and wondering if you could do this forever. What a thrill it was to stay at Marc’s Treehouse Lodge! I got to live out my childhood fantasies of staying in a treehouse. Mine was right on the river bank with a balcony and chairs overlooking the water. Exciting too is the thought that just outside the twigged walls of the cabin is wildest Africa. I slept most comfortably under the mozzie net cocooning the bed. I definately heard some wild cat calls close to my treehouse, fortunately after we had returned from a late night swim. Adorable, was a baby Nyala huddling under the plants next to the pool area. The walk back to one’s room is exhilirating to say the least as we found fresh animal spoor in the mud, and they were big footprints too! For someone who isn’t exactly big on red meat, let alone game meat, I was absolutely delighted by the Nyala stew served at dinner time. Beers were affordable and plentiful. Still trying to convince myself that the large, flat, fast moving reptile on the rocks when I went for an early morning walk next to the river, wasn’t a crocodile! # grown man running fast! Remember to pack your courage as this place rocks with adrenaline!